Potatoes Anna, a classic french dish, are basically potatoes, salt, pepper & butter. Somehow it’s all transformed into crispy deliciousness in under an hour. My husband loves these almost as much as he loves me. Seriously. I like to add a little lemon and rosemary for a subtle extra zing. This makes enough for 4 side dish sized portions. Preheat oven to 425 and slice the potatoes as thin as possible. A mandolin is best for this. With a pastry brush, coat the bottom of a 9-10 inch pie plate with melted butter. Layer the potatoes so they are slightly overlapping. You will be inverting this on a plate to serve so use the best slices for the bottom. Brush melted butter on the potatoes, sprinkle with salt, pepper and the lemon zest and place the sprig of rosemary in the center. Lay down another layer of potatoes, and brush with more melted butter. The potatoes should be crispy so I don’t suggest any more than 3 or maybe 4 layers. Bake for 50 min and when done cover with a serving plate and flip. 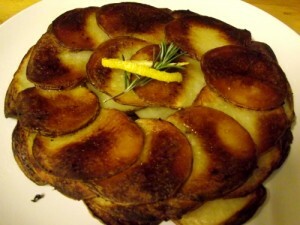 Serve Potatoes Anna in pie shaped slices.